Having a tough week? Then spare a thought for the Adélie penguins at Cape Denison, in Downtown Antarctica. Imagine…there you are going about your penguin business, waddling here and waddling there, happily tending to your penguiny errands when all of a sudden BAM! An alarmist newspaper article is published in the Sydney Morning Herald claiming that you’re all but practically wiped out off the face on Antarctica, all on account of some gargantuan iceberg. Meanwhile, you look around and see your fellow penguin buddies, with their furry little chicks, being none the wiser. Are you really all as iceberg-locked as they claim? Should you panic? Raise some kind of flippery alarm?! Are you all doomed to some kind of penguin Armageddon??!! This is the news we all woke up to, two weeks ago: a very confronting and quite alarming headline that rocked our icy world. Go ahead and read that now if you wish but the main sensational reports are that the numbers of Adélie penguins have dramatically and heart-wrenchingly decreased over the last couple of years, all because of a ginormous iceberg – the size of a small country – which wedged itself in the way of the penguin’s feeding route. This is the nutshell of the article, accentuated by a video reportedly showing a barren ice field devoid of Adélie penguins. If you’re an avid fan of the curious and noisy little buggers, like we are, you’d also be understandably disturbed. The quoting of official-sounding groups like the University of NSW’s Climate Change Research Centre, and its head professor, Chris Turney, certainly lends some seriousness to the reports. Maybe one would panic. Unless, of course, you are an expert in the field yourself, have just returned from spending an extended period of time in the place in question and, at the end of the day, know better. You see, at Chimu Adventures we consider Antarctica, and Cape Denison in Commonwealth Bay in particular, our ‘neck of the woods’. So once we came cross the felonious article we were keen to have a chat with our own Antarctica experts. Scientists, researchers and penguin counters (yes it’s a job and no, you can’t have it, sorry) who spend more time on the icy fields of Cape Denison, and in the company of the charming Adélies, than any other people we know. To get the latest news on the Adélie penguin saga, we contacted our favourite penguineers: David Killick (Journalist for the Mercury and a long-time, avid Antarctica expeditioner) and Dr Sally Hildred, who works for the Mawson’s Huts Foundation as Expedition Doctor and Penguin Counter (lucky devil!) Both have recently spent time at Cape Denison, having returned just days ago. They were as surprised as us to read about this impending doom-day-scenario as outlined by the SMH article. According to both our experts, who spent 6 weeks at Cape Denison counting and researching Adélies, there are a few ways in which the article – and video – are misleading. 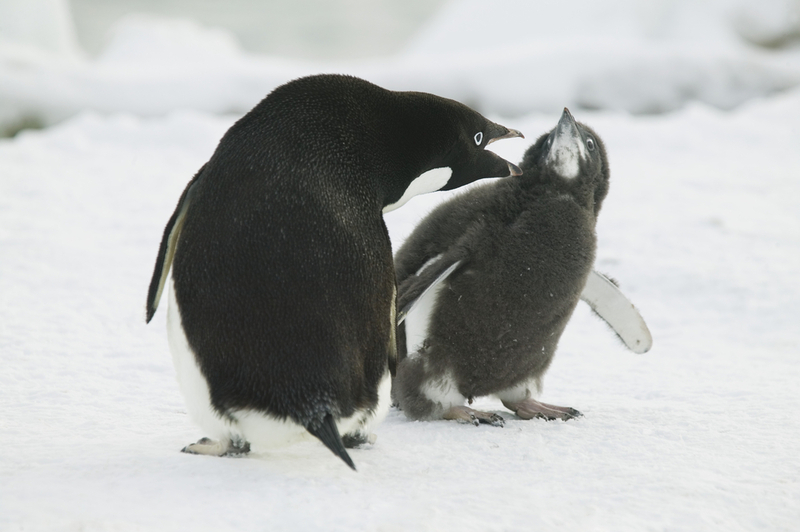 First of all, it helps to know that Killick has participated in four expeditions in Cape Denison since 1997 and, perhaps more importantly, is acutely aware of the ebb and flow of the numbers of Adélie penguins in the area, over the last century. The fact he was not the least bit concerned, after witnessing a healthy and noisy colony of Adélies last month, made us sigh in relief. The maths is awfully inaccurate The offending mega-iceberg in question arrived in 2010. The following year, penguin numbers had actually increased from 24,000 before iceberg to 26,000 after iceberg. By 2013, numbers were again down to about 10,000. No-one is quite sure where the 150,000 reputed ‘dead penguins’ the article quotes came from. No such numbers have ever been recorded at Cape Denison. The article doesn’t tell the full story – penguin numbers have always fluctuated greatly Unlike what the SMH article states, Adelie penguin numbers have fallen and risen dramatically over the last 7 decades, in a flowing pattern that seems quite natural. Obviously, penguins waddle about a lot more than Chris Turney realizes. They may or may not do it to confuse him, this is something we shall never know. But fact remains that when you look at the penguin count over the last seven decades, you realize that for whatever reasons, penguins have always tended to come and go at Cape Denison. Just on 10,000 penguins were reportedly counted in 1931 and, four decades later in 1974, this number had fallen to about 2,000 adults. A few years later it was back up to 3,500 and, 15 years later, it ballooned to 24,000. The fact that at last count there were 10,000 adult penguins can be read in various ways. For example: there are five times more penguins now than there were in 1974! Relativity plays a big role when assessing wildlife numbers and it is imperative that previous seasonal or yearly (or even decade-long) fluctuations be taken into account. Reporting only one side of the story is…well…reporting only one side of the story. Totally unfair. Relax! There really is no risk of penguin Armageddon The iceberg may still be there, but the sea ice between it and Cape Denison has finally broken away. Dr Sally reported seeing plenty of penguins and is eagerly awaiting the latest headcount being released by the AAd scientists. 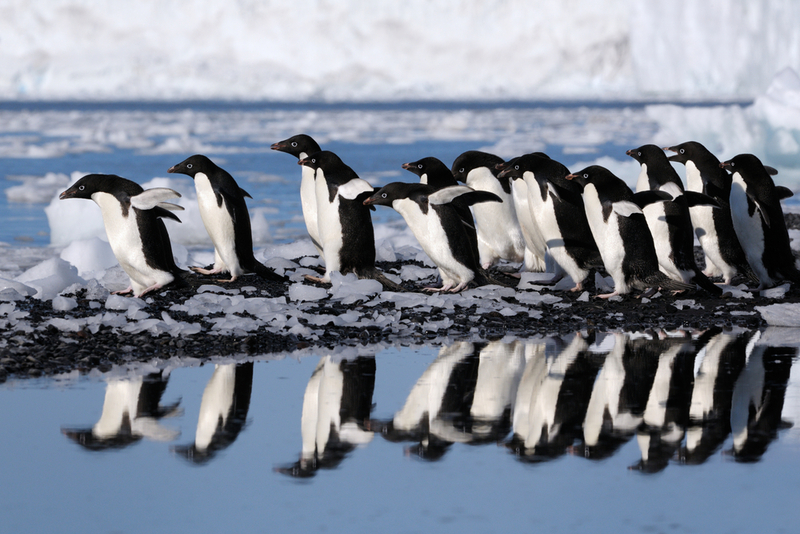 She’s optimistic, not only because she saw them with her own eyes, but because she reviewed NASA satellite photos and confirmed that as of the 15th February, the penguins have enjoyed an ice-free coastal access. The SMH article stated that the entire colony would be completely wiped out in 20 years if the ice didn’t break up, when in fact the last of the sea ice broke away just three days after the newspaper went to print, and had been receding progressively since about mid-2015. This is something the Climate Change Research Centre really should have investigated. Moreover, 2013 was a particularly harsh year and the sea ice then was quite substantial (up to 60-70km according to Dr Sally) and it correlates with decreased numbers of penguins for that year. Yet their recuperation over the last couple of years has been quite impressive. Resilient little devils that they are! The furry ones are currently looking good! According to David Killick, the numbers may be down in respect to two decades ago, but the Adélies he encountered were happy, fluffy, fat and feisty, the way they have always been. He also reported seeing plenty of chicks and the outlook for them is certainly a very good one. Dr Hildred echoes his sentiment and also reported numbers in the ‘thousands’ and confirms there were happy, noisy penguins all round. The expert quoted in the article was there barely a day It takes days if not entire weeks to accurately carry out a proper and conclusive survey of penguin numbers, something which Chris Turney simply failed to do. According to all reports, he was there for barely a day. That video…is misleading! The video included in the article is something which has David Killick slightly bemused. According to him, the footage of a desolate and very much penguin-less area of Cape Denison was shot in a region were penguins are not normally seen. At the very least, he has never personally observed them there. Ironically enough, the movie directors could have simply moved a little to the left and encountered healthy colonies thriving. Why this was not done is anyone’s guess. Fresh off the press will be the results of the rigorous survey of Adélie penguins carried out by the Mawson’s Huts Foundation in December 2015 and January 2016, with Dr Salluy at the counting helm. 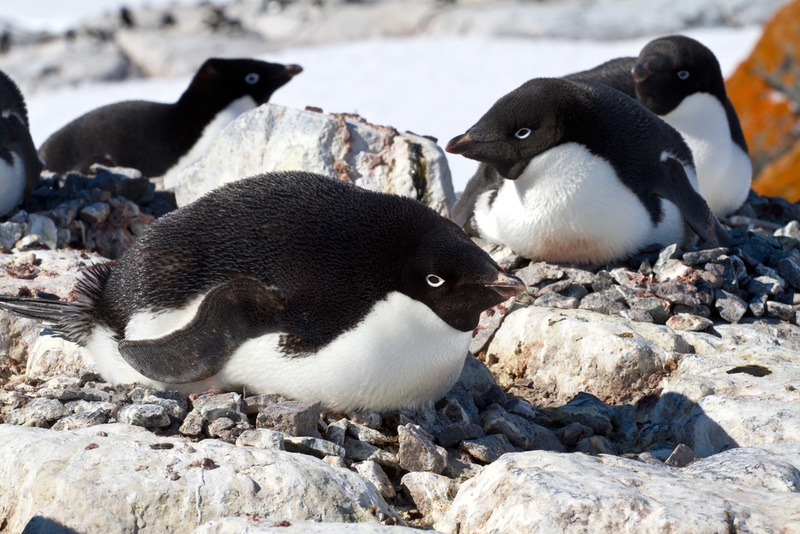 Working under the direction of Australian Antarctic Division scientists, heads were counted and breeding colonies studied, with data being interpreted to give a much more comprehensive picture of the very current state of the Adelie penguins at Cape Denison. Moreover, data will also be collected from remote cameras which sat in place for a total of 3 years, with the hope it picked up pivotal data of the all-important penguin breeding seasons and nesting success. It is always difficult to dispel myths and misinformation, most especially when such outdated and overly inflated ‘bad news’ gets as much coverage as a newspaper the calibre of the Sydney Morning Herald can afford. But we just had to try. Because someone has to stick up for the penguins. Interested in seeing penguins on Antarctica? Check the possibilities and tours here.